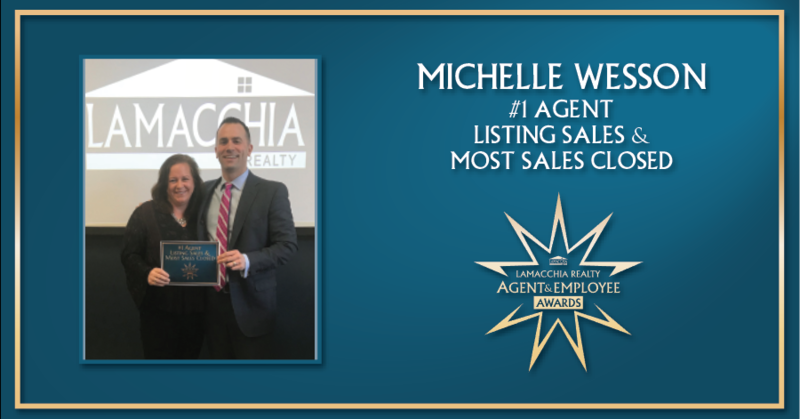 January 10th, 2018 – Lamacchia Realty is proud to announce Michelle Wesson as the #1 Agent in 2017 for Listing Sales and the #1 Agent for Most Sales Closed. These awards are two of the five 2017 Performace Awards announced today by Lamacchia Realty. In 2017, Michelle closed 30 listing sales and 50 total sales. Michelle has been a Realtor since 2004 and joined Lamacchia Realty in 2014. She serves as a mentor to many new agents in the company and was also a member of the company’s advisory committee. She assists and advises home buyers and sellers all over Worcester County on a daily basis. Michelle is a member of the 2017 Lamacchia Realty President’s Club and is one of our top performing agents. To hear what she has to say about being a part of Lamacchia Realty, click here. Michelle specializes in the Worcester area and sold homes in the following towns: Worcester, Paxton, Fitchburg, Millville, Uxbridge, Sutton, Holden, Blackstone, Oxford, Northborough, Grafton, Webster, New Braintree, Rutland, Shrewsbury, Westborough, Hudson, West Boylston, and Bellingham.